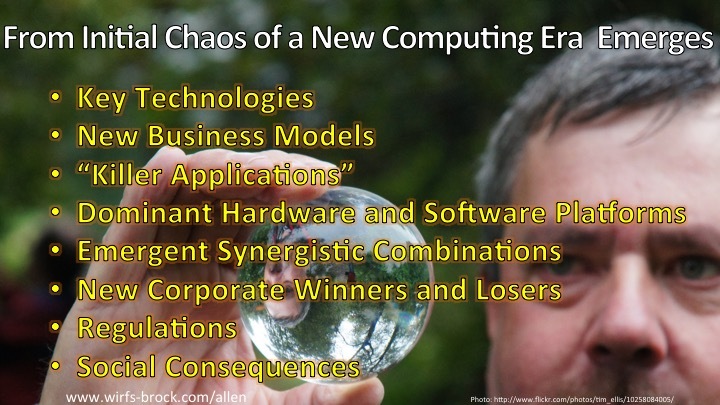 At the beginning of a new computing era, it’s fairly easy to sketch a long-term vision of the era. All it takes is knowledge of current technical trajectories and a bit of imagination. But it’s impossible to predict any of the essential details of how it will actually play out. Technical, business, and social innovation is rampant in the early years of a new era. Chaotic interactions drive the churn of innovation. The winners that will emerge from this churn are unpredictable. Serendipity is as much a factor as merit. But eventually, the stable pillars of the new era will emerge from the chaos. There are no guarantees of success, but for innovators right now is your best opportunity for impacting the ultimate form of the Ambient Computing Era.